While it may be fun to joke about how your house must be haunted, this is probably not the reason your lights are flickering on and off. In most cases, flickering lights are caused by a short circuit in the system. If it’s just one lamp or light fixture having a problem, you can likely just replace that one fixture and call it a day. 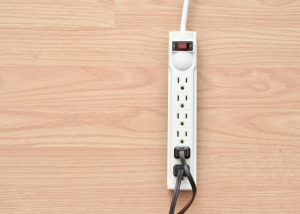 If, however, it’s occurring in an entire section of your home, then the short circuit is probably somewhere in the home and you have a bigger problem. If you’re experiencing this problem frequently, we recommend that you call a pro as soon as possible, before the problem grows worse. Have you ever noticed after putting your hand on a light switch or random spot on the wall, that it was warm? Hot spots typically indicate points in your electrical system where current is flowing in a direction that it shouldn’t be. Electrical current that is diverted to a point that it’s not supposed to go, such as another wire or directly in to the drywall, throws off energy in the form of heat. This is what you’re feeling when you notice a hot spot in your living space. They’re often an indication of a breach in your electrical system, and should be taken seriously. If not, you could find yourself facing a house fire. We don’t say this to scare you, but only to stress the importance of not ignoring a sign like this. Your circuit breaker box, a.k.a electrical panel, is designed to protect your home from power surges. When a part of your home’s electrical system suddenly starts to carry voltage beyond safe limits, the circuit breaker trips and that part of your electrical system will shut down until the problem is fixed. Often, the “fix” is simply resetting the circuit breaker because it was overloaded. Often all you need to do is unplug a few things and then reset the breaker. But what if the same circuit breakers keep tripping, no matter what you do? Then you might have a problem with that circuit, or it may be a sign that it’s time to upgrade your electrical panel to handle a higher energy demand. The good news is, our team can handle both of these issues!